Home › New Content › New Papers from Dallas, OR! New Papers from Dallas, OR! With support from the Dallas Public Library and the Polk County Cultural Coalition, we were recently able to digitize and add more newspapers from Dallas, Oregon! Issues from The Polk County Signal, Polk County Times, and Polk County Itemizer are now available online. Of these newspapers, the issues available from the The Polk County Signal cover the earliest period from 1868 and 1869, while the Polk County Itemizer covers a later period from 1903 to 1914. In 1868, J.H. Upton started the The Polk County Signal in Dallas, OR. As a small weekly paper, it covered issues of both local and national import. The paper had strong political leanings, supporting the Democratic party of that time and often arguing in favor of states’ rights. However, this meant that articles in this paper ranged widely, from simply offering support for Democratic politicians to using extreme and racist rhetoric. In 1879, the Signal would merge with the Dallas Itemizer to form the Polk County Itemizer, which for a time billed itself as “the best and largest paper in Polk County.” However, that was relative for the time as its circulation in 1884 would have only been about 950. In this transition, the newspaper became more politically independent, not affiliating itself with either party while moving away from the Signal’s sometimes harsher language. 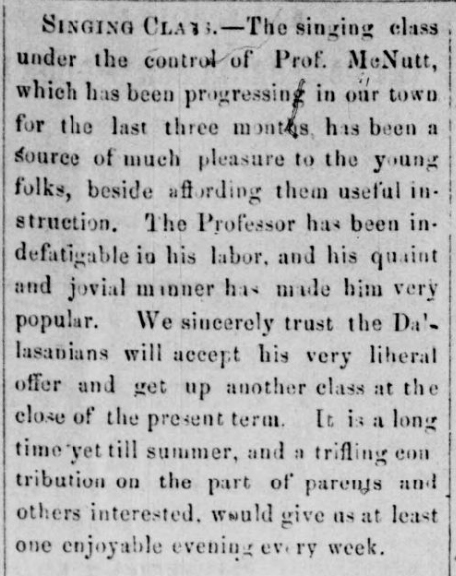 In this article about a singing class taught by a Professor McNutt, we get a sense of the type of pleasurable activities “Dallasanians” would have taken part of back then. To find out about other aspects of life in Dallas in the mid to late 1800s, browse through more issues of each of these newspapers on the Historic Oregon Newspapers website. Each issue of The Polk County Signal, Polk County Times, and Polk County Itemizer can be browsed and searched by keyword, thanks to optical character recognition (OCR) technology. In addition, these historic Dallas, Oregon newspapers can be downloaded as a PDF or JPEG file and saved for future reference or research purposes at absolutely no cost to visitors to Historic Oregon Newspapers.